Welcome to the SMALL Rally information pages. You too can join in the fun, a weekend about and for airplanes. This years events promise to be better than ever! We're looking forward to meeting and flying with you! Please tell your flying friends about this event. If you have problems, just let us know and we'll send you the information either through the mail or use E-mail, that'll be at your option. Would you please consider printing and posting the above Flyer for your airport? So you're wondering what a SMALL Rally is. It originally stood for Southern Michigan All Ladies Lark in the first rally in 1956. But it has been open to women and men pilots since1981. The Michigan SMALL Rally has become an annual event, drawing contestants from all over the Midwest and beyond. It is done with the goal of having fun and sharing the camaraderie among pilots. 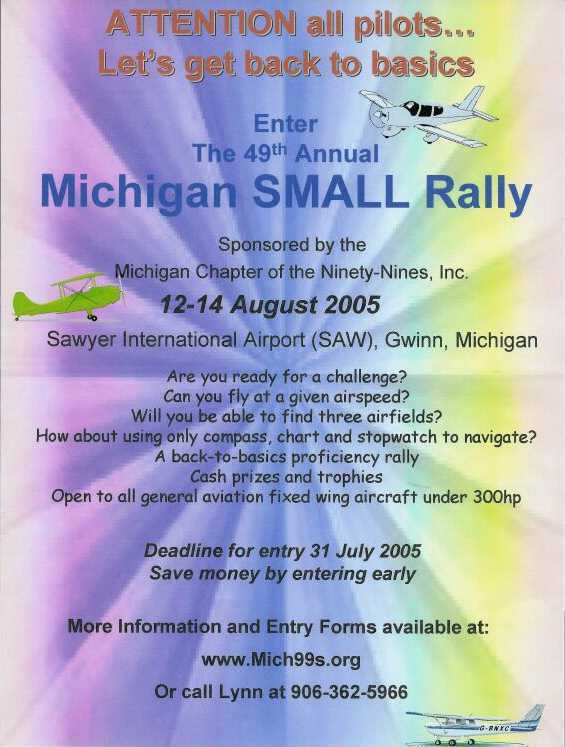 The Michigan SMALL Rally is a round robin proficiency event of about 200 miles in length. The rally consists of flying to three different airports and arriving over each at the exact time you predicted. When you pre-register for the event, you'll be asked to supply a handicap speed that you would like to fly, and the aircraft will be staged for starting accordingly with the fastest handicapped planes taking off first. The challenge is that you are not allowed the use of any radio navigational equipment. The participants use maps, compasses, stopwatches and timers. The runways are marked with a white timing line where the official rally timers are located. Did I mention that you won't know what airports you're flying to until you arrive for the rally? The planning is all done the evening before the rally. For a few tips on planning your flight, have a look at this link. There are trophies for the winning pilots and co-pilots. The top three contestants also receive cash prizes. There are various other prizes, door prizes and trophies awarded during the banquet. As a favor to the organizers of this event, would you please consider printing several extra copies of the flyer and entry forms and posting them at your local airport? Chairperson for the SMALL Rally. Don't miss these! Flight planning tips. Are you, or your children between the ages of 8 and 17? If so, here is an opportunity presented by the Experimental Aircraft Association to go on a FREE discovery flight aboard an airplane in your vicinity. We're trying to give 1,000.000 rides before the 100th anniversary of the Wright brothers first flights of 1903. Space for these pages provided by: The internets largest repository.